Full-time permanent position with well-established private practice. We are centrally located in San Diego, close to Scripps Mercy Hospital and we provide parking for our employees. We are hiring a Patient Appointment Scheduler who will handle up to 200 calls per day as part of a team of 3 schedulers. We schedule office visits and create new patient charts for all patients coming into our medical practice to meet with one of our Doctors. To be successful in this role you must enjoy interacting with people, be able to relate well with a variety of personalities and have good verbal communication skills. Must have a cheerful disposition with a calming affect when interacting on the telephone. A self-motivated individual who can work well with interruptions, understand the need to be precise with information-gathering tasks and is able to convey instructions effectively. Enjoy working as part of a team. Minimum two years of medical office experience. Understanding of authorizations required third party payors (particularly managed care plans), Medicare, Medi-Cal and workers’ compensation. Good command of the English language, professional grammar, and a clear understandable speaking voice. Ability to sit for prolonged periods of time. Ability to type up to seven hours intermittently throughout the work day. Answer calls requesting patient appointments and schedule appointments according to each Physician’s standardized template. Advise callers regarding practice payment/cancellations policies and pre-authorization requirements as appropriate. Enter patient demographics into the computer system. Confirm that authorizations for appointments are obtained prior to appointment and recorded on the patient’s account. Produce patient information sheet and charts for new patients. Review Physician schedules 48 hours prior for errors or re-scheduling needs. Perform other duties as requested by Physicians, Central Scheduling Lead, Administrator, or Business Office Manager. $17-18.00 hr. Benefits include health insurance, dental and vision. We offer a 401K savings plan. Paid time off for holidays, vacation and sick day pay. We also provide parking and pay for your parking. 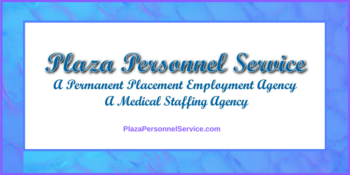 Plaza Personnel Service specializes in direct hire staffing for medical offices throughout San Diego, CA. Our goal is to make a great long-term match with the employer and employee. We will listen and understand your experience, your goals and your needs. We make every effort to match the candidate with the employer so that a long and happy working relationship results. Never a fee to the job applicant. Do you have a favorite social media site? Plaza Personnel Service is on Facebook, Pinterest, Twitter, Yelp, LinkedIn, YouTube and Instagram. Check us out on your social media site and see why other people have been happy with Plaza Personnel Service. Less than 10MB size and in PDF, DOC, DOCX or TXT file formats.